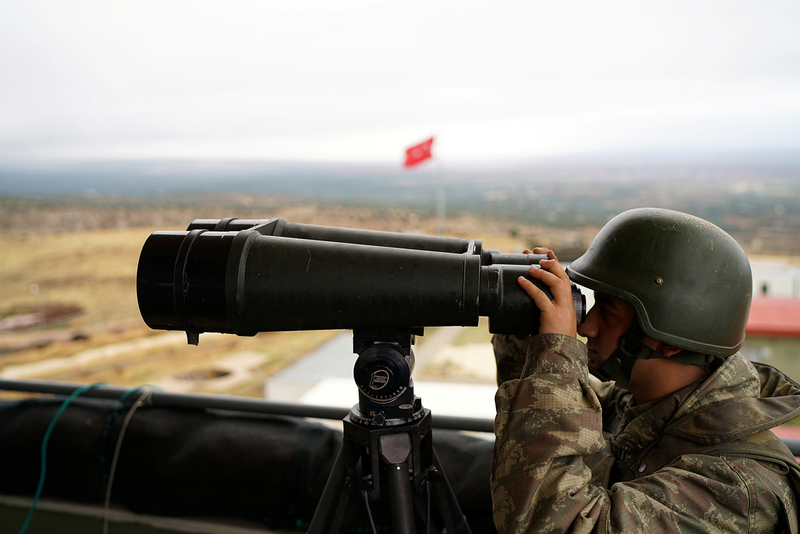 A Turkish soldier watches the border line between Turkey and Syria near the southeastern village of Besarslan, in Hatay province, Turkey. Turkey has directly blamed Syrian government forces for the deaths of several of its military personnel in an airstrike. Russian observers fear that if Ankara retaliates it may provoke a new serious crisis in relations between Turkey and Russia, which is supporting Damascus and has based anti-aircraft missiles in Syria. Turkey’s military command has announced that the Syrian air force hit a Turkish battalion situated in the area surrounding Al-Bab (25 miles northeast of Aleppo) in the early hours of Nov. 24. “Three of our heroic soldiers have died, 10 have been injured, one of them seriously. Those affected were immediately evacuated from the area of fighting,” reads an announcement on the Turkish HQ site. Turkey began Operation Euphrates Shield in Syria’s northern regions on Aug. 24. Since then the Turkish army has taken the border town of Jarablus and is now continuing to move southwest. According to President Recep Tayyip Erdogan, Turkey intends to remove Islamic State (ISIS) forces from a territory of 5,000 square kilometers [3,100 square miles] and create a “safe zone” for housing refugees. The Turkish forces plan to take Al-Bab, a town currently controlled by ISIS, which they will attack using the Free Syrian Army with the support of the Turkish BBC and armored vehicles. According to official data, 15 Turkish servicemen have died since Operation Euphrates Shield began three months ago, mostly due to confrontation with ISIS fighters, although one was killed in combat with Syrian Kurdish rebels. However, on Nov. 24 an unprecedented event took place: Ankara blamed Syrian government forces for the death of Turkish troops. “Such a response [in case Erdogan decides to use air forces] threatens to drag Turkey into war with Russia over who controls Syrian airspace,” warned Sotnikov. He added that the Russian C-300 and C-400 anti-aircraft missile systems located in Syria are able to take down any aircraft which attacks Syrian government military positions. In an interview with Kommersant, other Moscow-based analysts pointed to one circumstantial point: The message about the strikes by Syrian aircraft on Turkish forces was transmitted on Nov. 24, which is the anniversary of the death of the pilot Oleg Peshkov and when the Russian aircraft Su-24 was blown up in Syrian airspace. Kommersant’s sources do not rule out the possibility that this could be a deliberate provocation whose purpose is to bring Moscow and Ankara into conflict. It does not appear logical for Syrian forces to bomb Turkish troops: Although Ankara’s army is acting on Syrian territory, it does not come into contact with government forces, and is fighting exclusively against Kurdish rebels and Islamic State militants.